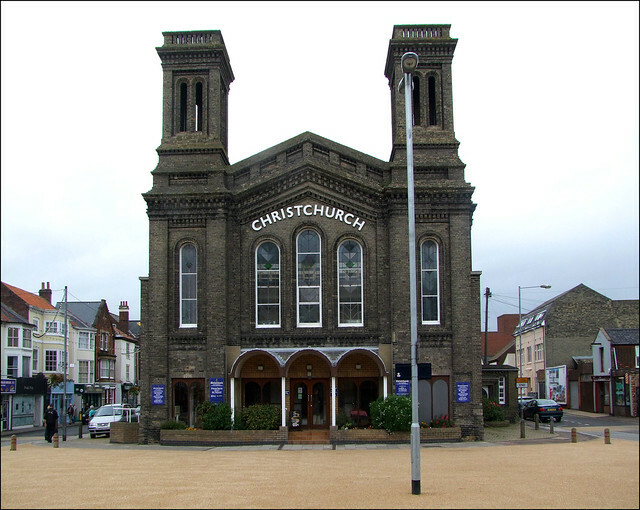 Christ Church sits imposingly in the centre of Great Yarmouth at what is being comprehensively restored with the aid of European money as St George's Circus. Directly opposite stands the currently derelict yet still elegant 18th Century church of St George, about to be converted into a concert venue. Christ Church seems austere in comparison. It was built as King Street Congregational chapel in 1854, and the architects were Kerrs of Norwich, although Bill Wilson in the revised Pevsner notes, curiously, that the plans were altered by Thomas Farrow of Diss. As it is now a joint URC/Methodist church, you might simply assume that the Congregationalists here were drawn into the United Reformed Church when it was created in 1972, but in fact they had moved out to join the other Congregationalist community a short distance off in Greyfriars Way in 1930, and this building was sold to the Methodists. It became Methodist Central Hall in 1938. The Great Yarmouth Methodist and United Reformed Churches then united in 1989, and the Congregationalists came back, the church being restyled as Christ Church. Bill Wilson, unsurprisingly, finds little to admire. As he memorably puts it, the church appears doubly starved of invention in comparison with St George to which it sits so close, not least because of its poor towers - did they ever have spirelets on them? The name on the frontage reads, curiously, CHRISTCHURCH as a single word, but everywhere else two are used. The main entrance below is perhaps the jauntiest feature, but that is an alteration of 1990. All in all, not exactly the church you'd hope to find in a seaside town. I came here on the Historic Churches bike ride of 2010, hoping to see inside, but Christ Church was not taking part. Turning again to Wilson, he notes that the interior has been split horizontally, with a chapel above and a meeting room below, and that the architect was Peter Codling, who also converted the Congregationalists' other church in Greyfriars Way into offices.